New Gtuner Pro and Titan One Firmware releases! The new Gtuner PRO (v3.30) received improvement in the code editor, such as auto indentation, code folding, highlight the current line, brace matching highlight, long line indicator, word wrap, show all characters, auto completion, save all and exit, remember current session for next launch. The GPC language received a new function to change the output protocol dynamically. Now you can open your scripts by double-clicking the file name in the GPC Files Area. The Options Window now features auto configuration wizard, where the most common settings can be configured automatically. 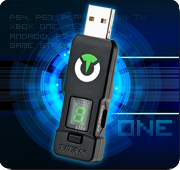 The Titan One firmware also received attention, such as: automatically turns on the XB1 controller when turning on the XB1 console; ability to use the XB1 protocol on PC; rumble strength adjustment mechanics. Thank you all for your dedicated and strong support! Correct, the PS Move Navigator can be used (wired or wirelessly) to play along mouse, substituting the keyboard. Does the PS move analog controller work ? So you can use that together with a mouse for FPS and all that. Does the script I sent you fixed the drift problem with your controller? if yes I can check if we can add it to the Gamepack. Thanks.